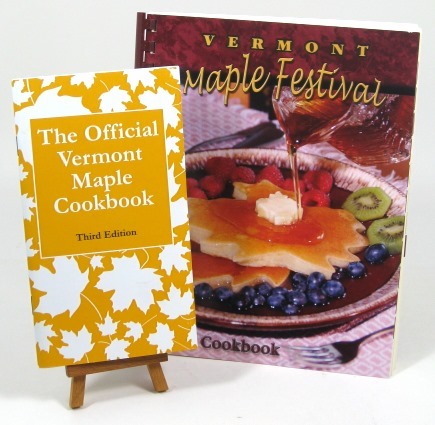 Vermont Maple Cookbooks Pair - 100s of great recipes! You get two great maple cookbooks! The first cookbook, the Vermont Maple Festival Cookbook (background), is published by The Vermont Maple Festival, Inc. of St. Albans, Vermont. This maple cookbook is jammed packed full of delicious, easy to prepare recipes that use pure maple syrup. The cookbook contains maple recipes for; Salads, Sauces, Pickles, Preserves, Dressings, Meats/Main Dishes, Vegetables, Breads, Cookies, Cakes & Frostings, Pies, Desserts, Candy & Other Treats, and Beverages. Inside the cover you'll learn about The Vermont Maple Festival, Vermont Maple Syrup Grades, Special Cooking Tips when using maple syrup, and the various types of Maple Products (Hard Sugar, Maple Cream, Maple Butter). Just a sampling of the maple recipes included; Maple Marinated Fresh Strawberry Sundae Sauce, Maple Apple Pilaf, Maple Coffee Cake, Seven Minute Maple Frosting, Maple Cream Cheesecake, and Vermont Pub and Brewery Maple Ale. Oh my! The Official Vermont Maple Cookbook, Third Edition (foreground) will make a nice addition to your maple recipes and cookbooks. Dedicated to the Vermont maple sugarmakers who take pride in producing pure Vermont maple syrup. 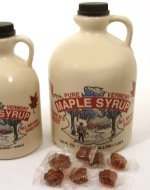 The booklet contains dozens of maple syrup recipes!